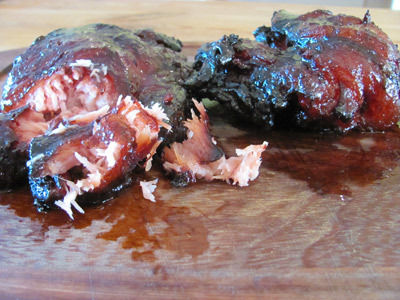 This Chinese barbecue pork or Char Siu recipe is so irresistible. 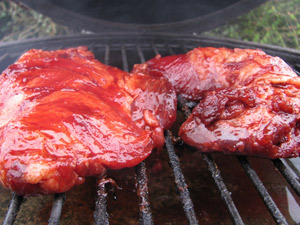 Moderately sweet, generously spiced with a deep red color, this pork has been marinated and then smoked low and slow. If you've ever been in Chinatown in any major city around the world you'll have seen large red strips of Char Siu hanging from hooks in the window alongside the Peking duck. The literal translation of Char Siu is "fork burned" which is a reference to the traditional preparation, skewered and barbecued over a fire. It should be moist and aromatic on the inside, sweet and slightly chewy on the outside, garlic and five spice being the main aromatic ingredients. It is generally served sliced as an ingredient in other dishes such a noodle soups of stir fry. It can also be served shredded in a bun (called Char Siu Bao) and if you want it shredded then this recipe is perfect for you. Traditionally it would have been cooked over direct heat but I've chosen to use the low and slow techniques that would normally be applied to pulled pork and it works a treat. The addition of red food colouring isn't tradition, it's more down to modern restaurateurs making their shop frontage more attractive. I've added it because I think that it readily identifies the end product but leave it out if you wish, it won't change the wonderful flavour. If you love Chinese food then this is a definite must and doubly so if you're into smoking your pork. Traditionally Char Siu is made using belly pork but for my Chinese barbecue pork recipe I've chosen to use the jowl or cheek, simply because I think that the meat is more tender, there's a similar amount of fat content to the belly and most importantly, no one else wants them so it's a relatively cheap cut of meat. If you'd prefer to stick with tradition then by all means substitute pork belly in this recipe. TIP - I used caster sugar because the granules dissolve a little easier in the viscous marinade but if normal granulated is all you've got then go with it, you might just have to stir a little longer. Trim the skin and excess fat from the jowls or belly (there will be a lot). Mix all the other ingredients together in a pan and warm through to ensure that the sugar has dissolved. Then cool. Place the pork in a flat marinade bowl and pour over the cooled marinade. Cover and refrigerate for 48 hours turning the meat every 12 hours to ensure every part of the meat gets its fair share. Normally I would argue that a marinade need no more than 2 hours in which to work and certainly that would be the case if we were just looking to flavour and tenderise the meat. The additional time here allows the colouring to penetrate deeper into my Chinese barbecue pork rather than just coat the surface. 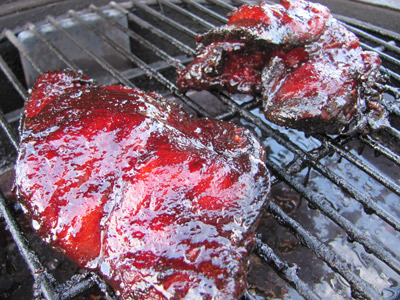 Smoke for 2 hours initially without disturbing the meat and then every hour, lift the lid and mop your Chinese barbecue pork with more of the marinade. If you want to shred it (like pulled pork) as in the picture below then the smoking time is going to be closer to 8 or 10 hours dependent on the size of the jowl. You also need to stop lifting the lid and basting the pork after 4 hours. Use your bbq thermometer and look for 190°F (87.8°C) as the marker that your pork is ready to shred. When cooked, take your Chinese barbecue pork off the heat and allow it to rest for 30 minutes before carving / shredding.